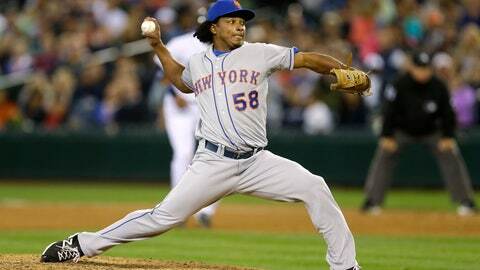 NEW YORK (AP) — Pitcher Jenrry Mejia was released Tuesday by the New York Mets after serving three drug suspensions. The 29-year-old right-hander from the Dominican Republic was told in July by baseball Commissioner Rob Manfred that he could return to the big leagues in 2019. Mejia was suspended for life on Feb. 12, 2016, after his third positive test for a banned steroid. The drug agreement allowed him to apply a year later for reinstatement that would be effective a minimum of two years after the ban started, with the decision at the commissioner’s discretion. He has four years, 140 days of major league service and would have been eligible for salary arbitration. The Mets could have tried to cut his salary to $1,383,200 had he remained on the roster.